I know there are a lot of other people already sharing their homemade tools for building level data to load into nametables, but after trying various different programs linked on the wiki, I really couldn't find anything that really worked for me. Shiru's Screen Tool is pretty good, but considering it crashes every time I try to load anything I save in it, it has pretty limited utility for me. Most other well-made tools seem to be primarily created for rom hacking purposes. Most of it was made in just a few days, and only for myself, so the code is pretty sloppy, and several features are sort of half-assed as I just needed fast results, but I'm hoping to iron that stuff out over time, so let me know of anything you find if you decide to give it a go. Hopefully it's not too early to share it, but keep in mind everything is subject to change. Same goes for the export format - Originally, I didn't put much thought into optimizing load speed, but I've added the option to split metatiles into seperate tables for each "sub-tile", allowing faster access using indrect indexed loads (since you're limited to 256 metatiles for each set anyway). There's really no reason to not use this format. Currently my scrolling/loading algorithm never spends more than 1200 cycles outside vblank, which I found to be pretty effecient. For the record, this is not expected to work in any browser except from Chrome or, I guess, other Webkit browsers. The 5-10 seconds I spent testing it in IE didn't reveal any issues, but using it will be at your own risk. I've never had any problems with it. What OS are you running? Also, wouldn't it make sense for you to make the source available, so people could run your editor offline (and faster)? I'm running Windows 8.1 btw. Usually had to get around it by saving the nametable/CHR/etc. separately. Anyhow, this web tool looks interesting. I've been kinda wondering about using HTML5 to make tools lately, it's gotten to be a pretty viable for a lot of things. That's a very good idea. The palette may be a little superflous (it would take a few seconds just to edit it manually), but more import formats makes a lot of sense. I made the tool primarily for non-programmers to use, but I found it a very effecient way to edit my levels, so I'll be adding features as I need them. Thanks for sharing Sumez! Tested it out some this morning and it worked well. This tool looks great! How would a noob such as I go about loading these in a game? Well how to implement it is up to each individual - I'm pretty sure my own implementation could afford a few optimizations. As I said, I'm open for suggestions for new ways to structure the level data, but as of now, everything is saved into the 16x16 and 32x32 metatiles you see in the editor when exported as a assembly file. - For each metatile I read from two of the tables generated by the editor, the top left and bottom left, or top right and bottom right. Which two I use can be decided by one of the bits of the original coordinate. - Repeat the same process for the smaller metatile, except this time I just load the left column on my first pass, and then the right column the second time, as I'm loading 16 pixels at a time. You could also load in just one row of 8 pixels at a time (if you're using horizontal mirroring or want to save cycles), or the full metatile of 32 - but I don't think there's enough vblank time for that. You can also speed things up using a "secondary stack", which is what I actually do, and push into it from the bottom up. 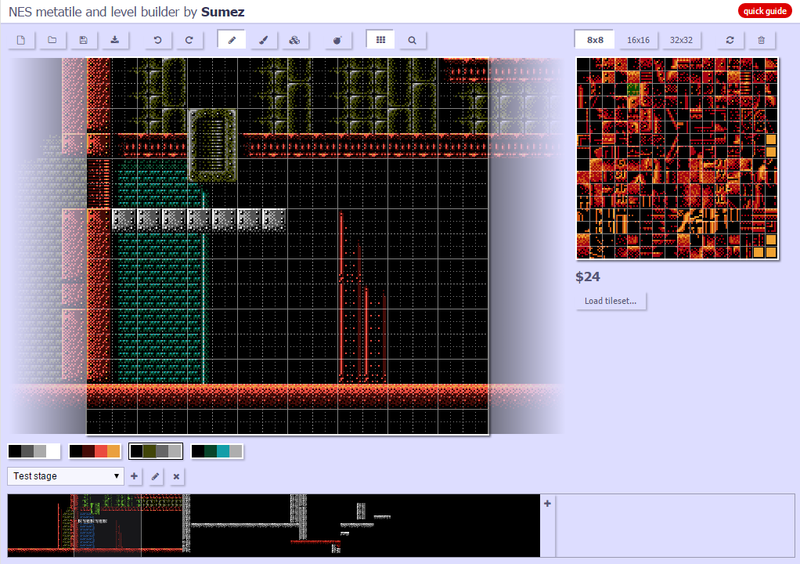 The only way I can see a generic level editor working is if it uses user scripts for exporting the data. A hardcoded format is OK for people who are just starting and don't know any better, so anything is fine, but experienced coders have to deal with the specifics of their scrolling engines, collision attributes, storage limitations, and so on. Should be very easy to do, since that's obviously what it does internally when exporting to CA65. I created this only for my own needs, so at this point all it does is what I needed it to do. But it's clearly open for expansion. You should host it on GitHub if it's open for expansion. AFAICT, if it isn't on GitHub or a private repo controlled by the main dev, it's not worth committing to. Some people prefer GitLab or Savannah to GitHub for various reasons. Are you including those? Is it suspicious to anyone that GNU.org rated GNU Savannah as the best code repository? How about rating by... ease of use, functionality, etc? I use Git for all of my programming stuff, mostly because I don't want to worry about deleting old code, and usually work from different computers. Personally I prefer BitBucket because it allows private repositories, and my code tends to feel a bit "personal" to me. But GitHub is really good. I'd not recommend them. Like them or not, Github is the biggest and basically only used repository site. I'd also not suggest using anything GNU, as people only pushing GNU are cancer to the Linux communities. I also do use BitBucket for my private repo's for me and my friends. Github for public projects.